Close up of writing board showing the signature of “Mrs. E. A. Lusk,” ca. 1870s. 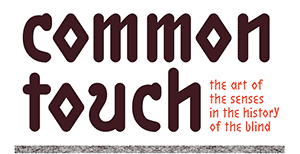 My work on Common Touch has provided me with many opportunities to meet individuals who have been generous and gracious with their knowledge of accessibility, disability studies, and printing for the blind. As a curator who works with archival collections, I also on occasion become familiar with individuals who can be a little less generous with their knowledge. Yes, I am talking about the people who I learn about through inscriptions, notes, and imprints on the manuscripts, prints, and ephemera I work with daily. Esther A. Lusk, a student at the New York State Institute for the Blind circa 1869-circa 1873, has become one of my enigmatic individuals from my work on “Common Touch.” I started to know of her through the inscription of her name on a pasteboard writing guide. “E. A. Lusk” is written on the tablet (a thick paper board with grooves to guide the handwriting of a person who is blind) that accompanied the Jenny Partridge letters mentioned by artist Teresa Jaynes in her May 5, 2015 post. Work with a recent research fellow again brought Ms. Lusk to my attention. We not only hold her writing board, but an 1874 letter and an undated essay written in her hand. What I know of her is from her own words and her few known genealogical records. So let me please introduce you to the enigmatic Ms. Lusk. Esther A. Lusk was born Esther Anna Sutliff in New York on April 29, 1832. She probably married James Lusk in 1852 at the age of about 20. She died on January 14, 1883 in Sherbourne, New York and is buried at the Sherburne West Hill Cemetery under a gravestone inscribed “I shall be satisfied when I awake in his likeness.” During her life of nearly fifty-one years, Lusk was widowed before the age of thirty, lost her sight, traveled cross country to Kentucky, and was a boarder on a New York farm in the years before she died. Although I wish I knew more about Esther, the little that I do still makes her a gracious contributor to “Common Touch.” Her “loving actions” have stood the test of time. Census records and “Find a Grave Index” on Ancestry.com accessed July 6, and August 28, 2015. Thank you to Library Company 2015-2016 fellow Erica Fretwell for her transcriptions of Lusk’s manuscripts and her brainstorming about their provenance.